Kenny Knight and Barbara Noble claim Steve Scalise never spoke to EURO: Did the House majority whip wrongly confess to speaking to David Duke’s group? 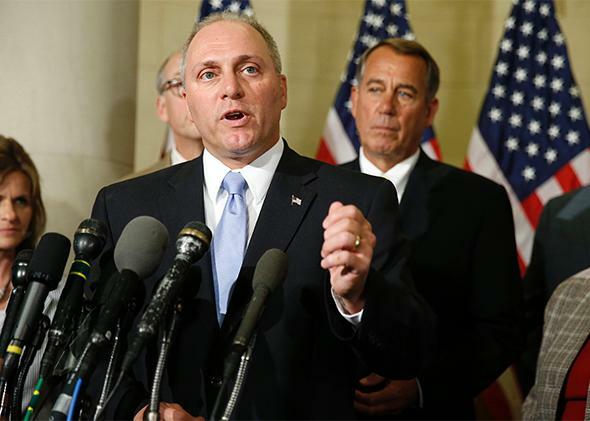 House Majority Whip Steve Scalise speaks to the media after House Republican leadership elections in the Longworth House Office Building on Capitol Hill in Washington, D.C., on June 19, 2014. Knight estimates that about two-thirds to three-quarters of the people in the hospitality room at the civic association meeting were local residents who weren’t there to attend the EURO event, and about one-third to one-quarter were EURO convention attendees who arrived early and filtered into the hospitality room to drink coffee and kill time. “I don’t think Steve was aware that there was a small contingent of people who came and sat in the audience prior to the EURO meeting,” Knight said. I asked Knight if there was a sign on the hospitality room indicating it had been reserved for the EURO conference. Noble said that there was no signage, banners, or mention of the EURO conference at the civic association event and that Scalise left immediately after giving his talk. The first report of Scalise’s alleged comments to the white supremacist organization came on Sunday from Louisiana blogger Lamar White, who uncovered anonymous posts on Stormfront, a longstanding neo-Nazi online forum.